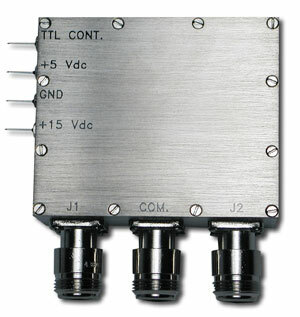 The new 50S-1352 from JFW Industries is a high-power, RF "hot switch" that covers cellular, PCS, UMTS frequencies, and beyond. The new 50S-1352 from JFW Industries is a high-power, RF "hot switch" that covers cellular, PCS, UMTS frequencies, and beyond. The 50S-1352 is a 1P2T, PIN diode switch capable of switching up to 50 Watts with the power on. Solid-state construction, low insertion loss (0.9 dB maximum), and and operating frequency of 800-2500 MHz make it a perfect fit for both laboratory test and base station applications. Connector options include SMA, TNC, and N, with custom designs also available.